It's something we'd like to try and get, if possible. We'll always be interested in trying to get attention from big content creators. Okay, this probably Will have some anger on it but this is probably something needed to be said, I think this is a good idea but i Wonder what are your steps to get stuff done, probably one of you is studying marketing or something related but what you did with compmc was very lame I remember being so into stratus and badlion that even posted stuff about mapmaking and sht to help the server but you kept saying that "we Will announce our partnertship with you guys soon" but that never happened even badlion did earlier because how we were trying to help this, outreaching 1000+ at our peak, so with this in mind are you going to ignore the importance of using this platform to get New players? That are interested on competitive? Also what is the "Media" part of the job is that posting stuff on Twitter, do you have a YouTube Channel i dont think u do but if u dont why?, are you going to open app? 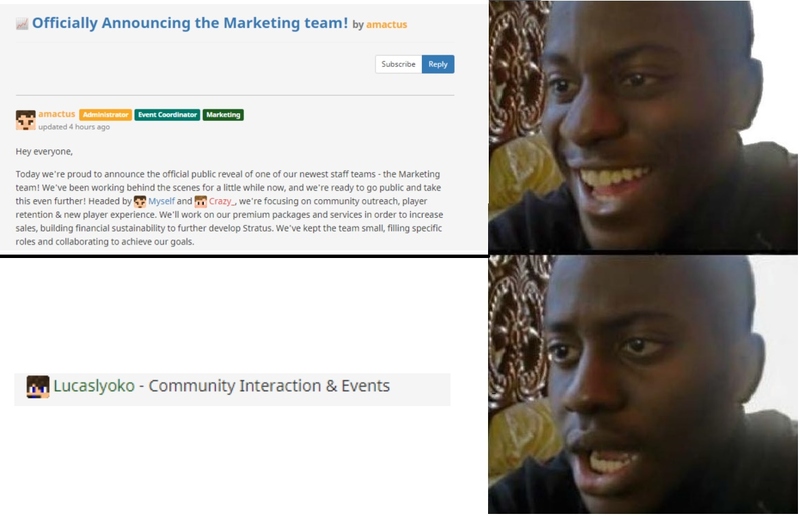 Probably way better to get New People in a marketing team than players that like the server or play this alot. Thanks for raising some concerns, I'm always happy to answer any questions. You're right to presume that one of us is studying marketing (though I don't believe it makes me any kind of expert on it, but at least it gives me a good understanding of some of the theory and strategies to aim for). I can't speak for what happened with CompMC. I remember partnering up with you guys on Zildith (back when that was a thing), so I'll assume timeline wise all this happened prior to me joining the Stratus staff team. Feel free to message me some of the details on Discord. The media role very much is focusing on outreach through our social media platform(s). Currently all we have is Twitter, but we have discussed adding a YouTube channel and posting little recap videos for community events that we don't stream. We might look into posting some tournament related content on YouTube as well, once that's all set up. amactus and I haven't discussed opening applications, since we pretty well hand picked staff members who expressed interest in specific areas of the marketing team and/or its responsibilities (and who we thought made a good fit in those roles). We're not opposed to recruiting outside of the staff team, as you can see with Lucas. We might consider open them further down the road, should we feel it's needed or that we're lacking in certain ares. In regards to your other comment, we had intended to announce this a few weeks ago, but things came up with the holidays and we postponed it. We have certain projects in the works that'll greatly help out our team members with finally having a rank and that "official" recognition of their role and what they do. We felt it was time to release the team. Will you guys affect competitive in any way? Can you elaborate? Stratus's main focus is towards the competitive side of Minecraft, so of course one of our main goals is to help achieve being "the home of competitive Minecraft". Today I'm happy to announce we're welcoming a familiar face from OCN & early Stratus to the Marketing team, Matic0B !! Matic has been working with us over the past few weeks, and is now ready to step up to his role working with content creators and on user experience design for Operation Ares.